Timothy Hallinan’s quirky thief/detective (last seen in Little Elvises) is forced to delve into long-past Hollywood scandals by a nonagenarian crime boss. 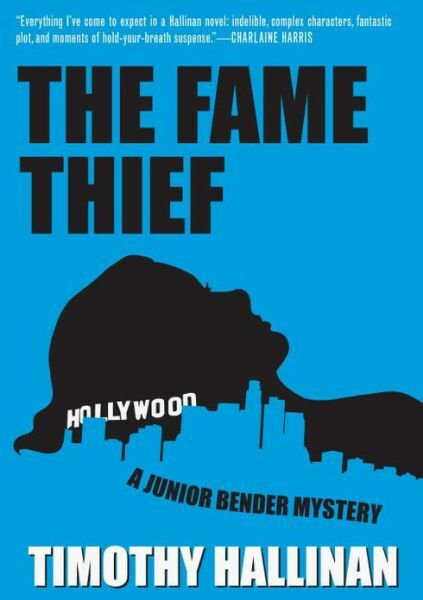 The Fame Thief is Timothy Hallinan’s third novel starring Junior Bender, a professional burglar with a second calling as a crook’s detective–because bad guys need their mysteries solved, too. Irwin Dressler, no less powerful a crime boss for his 93 years of age, hires Junior against his will for a strange 60-year-old case, the theft of a Hollywood actress’s most valuable asset: her fame. Dolores La Marr was a kid from Scranton, scarcely beginning to make it big in 1940s Tinseltown, when her association with that era’s fashionable gangsters landed her in a nasty, full-color scandal. Strangely, no one but Dolly took the fall, and all these decades later, Dressler still wants to find out who set her up. Junior quickly learns that this mystery is not as dead as it seems, and that some dangers only increase with age. The refreshingly unassuming Junior is a fun riff on the typical private investigator: his specialty–committing crimes, rather than solving them–brings him an unusual perspective. The elderly Dressler is a fabulous, deadpan wiseguy in “eye-agonizing” golf pants, backed up by two unusually domestic versions of the standard muscled goon. And Junior’s own domestic concerns–a teenage daughter, her jokester boyfriend, an ex-wife and a randy new girlfriend–fill out the eccentric, likable cast. Fast-paced action and a building body count pair nicely with humor in this series, bound to keep the reader coming back for more. This review originally ran in the July 12, 2013 issue of Shelf Awareness for Readers. To subscribe, click here, and you’ll receive two issues per week of book reviews and other bookish fun! Rating: 6 slow-speed car chases.